Jeter is Retiring. Is Anyone Surprised. Back during spring training, Derek Jeter announced that the 2014 season would be his last. We were not surprised. He had just seen his last “core four” brothers (Mariano Rivera and Andy Pettitte) go through an emotional farewell the season before. He had some personal unfinished business in coming back and ending a season on his own terms, instead of due to injury. And it was to be his 20th season, all with the New York Yankees, an nice round number! Throughout the season we have watched the Jeter farewell tour and yesterday the New York Yankees declared September 7, 2014: Derek Jeter Day. I can get on board with the whole tour thing where he got a 3 minute tribute in each city the Yankees visit. But to have the whole big Yankee ceremony with still three weeks to go in the season, have all his teammates (and him) wear the Jeter patch and fly the Jeter flags all over the stadium everyday while they are still playing? That seems a bit much and must be strange as hell for Derek. But I guess if someone is going to get that treatment, it’s him. Now there are a couple schools of thought on the whole Derek Jeter thing. There are five or six people in the whole world that hate Derek Jeter. There are a few more that think he is overrated with his poor defense and declining overall skills, but still respect him anyway. A few more think he gets too much rope from fans and team management in terms of playing time, position, batting order, etc. Trust me, I know all those arguments and even agree with many of them. But even those are not enough to tarnish the career of Derek Jeter or his place in baseball history. 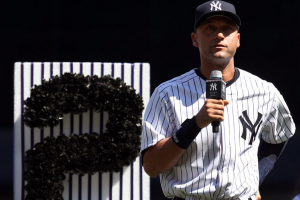 Whether you agree with the farewell tour thing or not, it has given the baseball world an opportunity to reflect on the career and impact of Derek Jeter. Sure, he gets a whole bunch of gifts, cash for his charity, accolades, and grooved fastballs in the All-Star game (*wink) but maybe one of the most interesting things for me has been the concept that there is a player out there in today’s sporting world that still deserves a “farewell tour” at all. Sure there are great players in the game that will be All-stars and Olympians and role models and Hall of Famers and will certainly have special ceremonies in their futures. But who of them will be the next to have that honor in every opposing city they go to? There are just are no other Jeter’s out there. I don’t think you can name anyone that will get a league wide farewell tour and send off like Jeter did (or Mo before him). They just are not out there right now. Even the best players in the game would need to have many, many, many more years of not only amazing statistics including championships…but would also have to break through that universally beloved and respected barrier. Pujols, McCutchen, Trout, Kershaw? Sure…all amazing players but there is no one that can “check all the boxes” and enter Jeter territory. Even David Ortiz, who has created another level of adoration since joining the Red Sox still seems to be missing something. He has come out publically and said that he will not have a farewell tour when he decides to retire. Well David, I don’t think you have to worry about that. Whether you are the handful of people that just want to be mad at Jeter because you are sick of everyone else loving him or not…there are things that cannot be denied. Beyond being a hero and role model to multiple generations of baseball fans, he also is one of those guys that is respected and adored by his peers. Part of the cool thing we have seen over the past few years (culminating in this year’s farewell tour, All-star game and final stretch) is that there are countless players, managers, coaches, and support staff that absolutely worship the guy. Not just his current and former teammates who talk endlessly of his selflessness, dedication, calmness, and leadership. But his opponents too, who talk of his hustle, work ethic, comradery, mentorship and ability to deliver in the big moment under constant pressure. He is also one of those athletes that breaks though the sporting barrier and is recognized outside of his job as a baseball player. So many players that grew up wanting to be Jeter, wore #2 for Jeter, try to act like Jeter or the ever popular…”play the game the right way” like Jeter. What does that mean exactly? Well beyond the comments above, it probably has something to do with the fact that he played all the way through the most tainted era of professional sports and was never even in a rumored discussion about being linked to steroids, amphetamines, creams/clears, growth hormone or even Rogaine. There is a very, very short list of superstar players that can say that. So yeah, I think there should be a Derek Jeter Day. In fact, I was looking forward to seeing what the Yankees did for the captain. But I honestly expected it would come either at the end of the season or even next year. Not while he was still playing and trying to help his team in a playoff race. The whole idea felt weird…like going to a funeral before the death. DJ has always been the guy that left the dramatics on the field, not off it. In fact, off the field he is quite boring. The guy has amazingly kept his nose clean for 20 years doing the most high profile job in the world’s biggest sporting market. He never says anything outlandish, he always defers praise, he just wants to help the team win, he runs a wonderful charity…boring! Sure we heard about “St. Jetersburg” the freakishly huge mansion he has in Florida, but every professional athlete has a mansion, so big deal. Even though he has dated all of the hottest supermodels and stars on the planet, he isn’t married and none of those relationships ended up “Tiger” or “Arod-ish” so no one seems to care! See…squeaky clean. So the fact that the Yankees are putting on the show this early seems odd. You had to imagine Jeter hated that part of it as well, but he knew that this would be coming when he announced his retirement all those months ago. Still, its feel un-Jeter-like. OK, OK, OK. Back to my thoughts on the actual Derek Jeter day. Basically, I cry when my kids do something new and amazing. And on Derek Jeter day. declining role both offensively and defensively! I have two young kids in sports and while I have never said they should be like Jeter, I can only hope that they end up with at least of a few of his traits. I never forced my Yankee fandom on them or my wife, but they have inadvertently become fans as well (probably because every game is either on TV or the radio). My son and I sat together a few years ago and watched the game that DJ went 5 for 5 including his historic 3000th hit (a home run off of David Price). It was his first real “dramatic impact” sports moment on TV and that created yet another Jeter fan. It is pretty cool that we get to share that bond and it has made the farewell tour that much more special. When he found out that Jeter was “not going to play baseball anymore”, he cried a bit…so did I son, so did I. Jeter secured my love for baseball in 1996, and secured my sons in 2011. I think “Circle of Life” is playing somewhere in the background?! I am lucky to have seen Jeter play live a number of times. I saw him in old Yankee Stadium, I saw him in new Yankee Stadium. I have seen him hit doubles and homeruns, steal bases and make jump throws. The last hit I saw was a classic Jeter-ian single to the opposite field during his farewell tour series in Minneapolis with my family where we all wore our Jeter shirts along with 40,000 other people. I am glad that my kids got to see a guy like Derek Jeter play and one day we will go back to New York and see his number in monument park and Cooperstown. Which brings me back to Derek Jeter day…for real this time. Our family watched Jeter day together. My Daughter made me a Jeter picture. We all wore our shirts again and we watched every moment of the ceremony. The kids constantly asked who all the old guys were that they kept introducing…while Mom and Dad tried to fight back the sniffles! Even after all this time, I am still amazed at the showmanship of the Yankee organization. It’s over the top as always. that they bring out Michael Jordan for Jeter. I guess now that we are winding down, I am sad that it’s over. 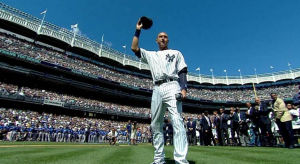 I still love the Yankees, but Jeter is the last remaining thread to those original memories. My wife often says that she doesn’t know if she can be a Yankee fan now that the last of the core four are gone. I suspect that there are a lot of people who feel that way. There might not be another Jeter, so I am glad we at least get a chance to celebrate his career while he is still on the field. I have said all along, I just wanted him to be healthy for the whole season. So far that has happened. The playoffs would have been magical but it is gonna be a tough go for the Yanks this year. That team just can’t score runs and Jeter has been part of the problem, but the truth is no one is going to remember that part. There are still a few more tear jerking moments to come, and likewise a few more empty pages in the Derek Jeter book to be written. A playoff stretch drive (doubtful), final home stand in Yankee stadium (Girardi sending in a defensive replacement in the ninth inning to let Jeter walk off the field to a final standing ovation from the city that adores him), the final series and at bat of his career in Boston (if he decides to play it). And then fast forward a few years, the question is not if he is a first ballot hall of famer…it’s will he break the votes record? Not to say he deserves the most votes ever, but given the love affair baseball has with him and the current generation of the players eligible (including many potential PED asterisks), I think you shouldn’t be surprised! It will be a tough next few weeks. But I suspect it will be an even tougher 2015 and beyond. It’s hard to imagine a lineup card without #2 on it. 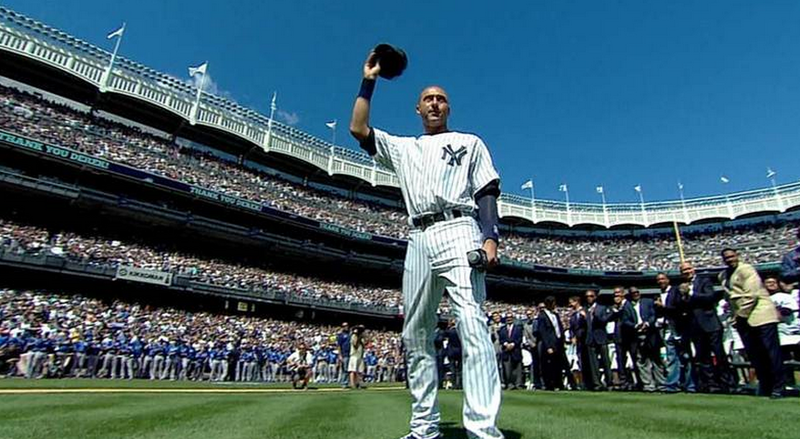 It’s hard to imagine who the next number will be in Monument Park after Derek Jeter. And in the Moonen household, it’s already hard to imagine the Yankees without their captain.